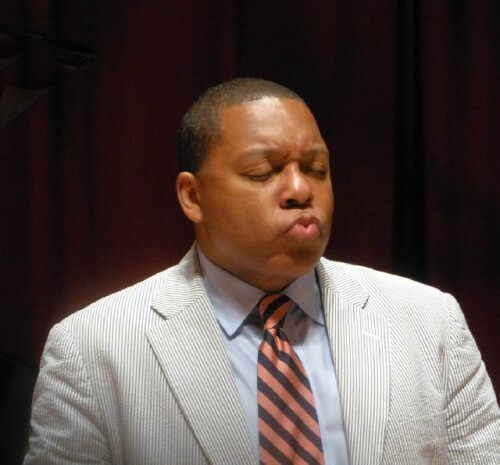 Wynton Marsalis and Christian McBride returned to Tanglewood after an interval of many years. 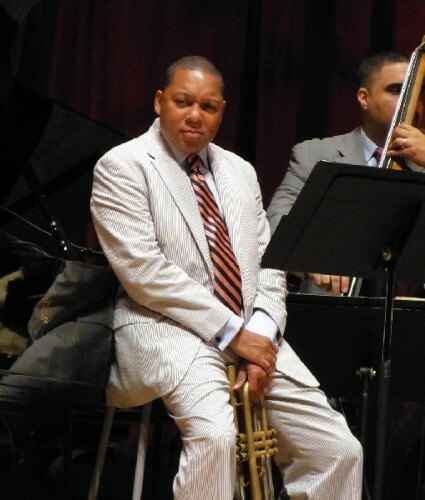 Multiple Grammy winner Wynton Marsalis. Taking a break during the set. 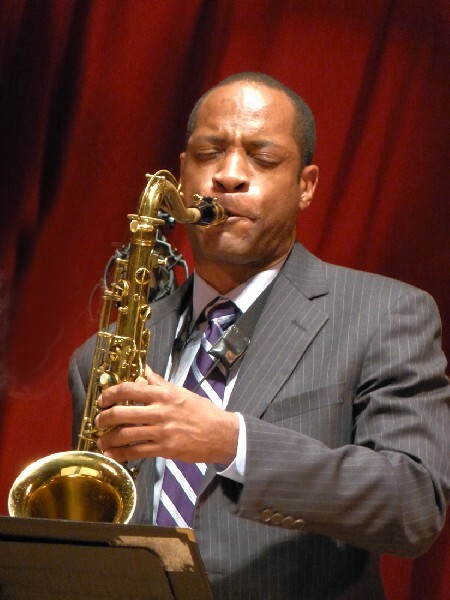 Sax Player Walter Blanding is a member of the Jazz at Lincoln Center Orchestra. The quintet performing straight up jazz. 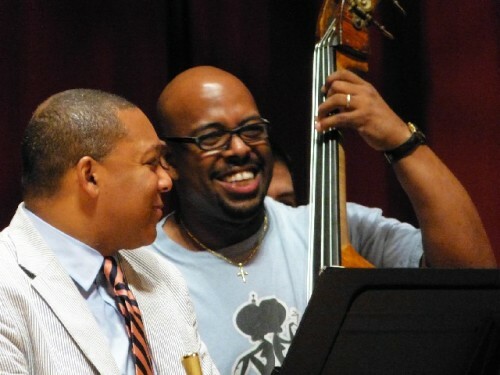 During the jam session Carlos Henriquez shared bass with McBride. Drummers left, Ulysses S. Owens, Jr., and Ali Jackson were having a good time. 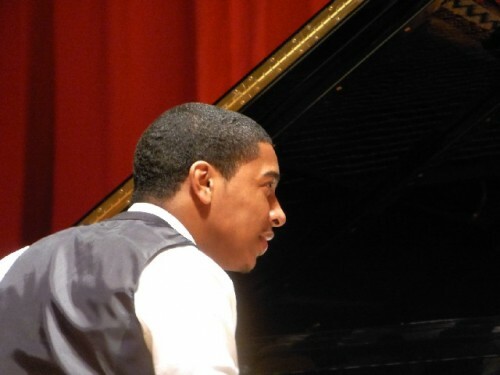 Piano prodigy Christian Sands started playing at three and composing at five. Pianist Dan Nimmer listens to Sands. A heart felt performance at Tanglewood. 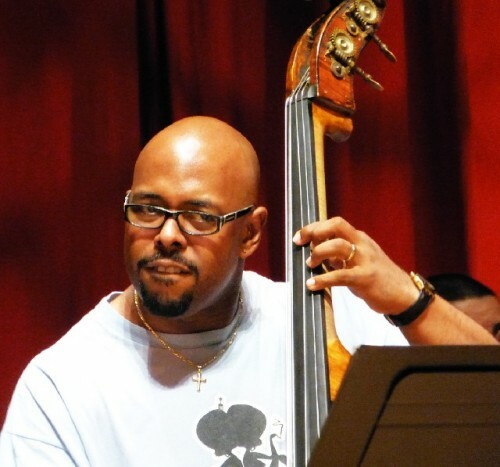 Christian McBride Trio with Pianist, Christian Sands, and Drummer, Ulysses S. Owens, Jr. Both nine time Grammy winner, trumpeter Wynton Marsalis leading his Quintet, and renowned bass player Christian McBride with a trio, commented warmly on the honor of returning to Tanglewood. But, for both, not in many years. On an overcast Monday evening, with soft sprinkles that did not discourage a large gathering on the lawn, they thrilled a near to capacity audience in Ozawa Hall with a stunning, three hour performance connected by a twenty minute intermission. Adding to a remarkable performance by Chris Botti, a mixed classical/ jazz appearance by the French based Ebene Quartet, and Chick Corea with Gary Burton slated for Sunday, August 26, there appears to a be a welcome policy shift. Tanglewood has presented A List jazz artists this season. Fans, however, lament the elimination of the established, season ending, annual Tanglewood Jazz Festival which introduced many emerging artists. Last night, however, we laid back and imbibed intoxicating, top shelf jazz. With a dash of ironic humor McBride described his “Cocktail Trio” as a warm-up act for the top billed Marsalis Quintet. It proved to be anything but as we were introduced to a prodigy, the now twenty-three-year old pianist, Christian Sands, who started playing at three and composing at five. We quickly realized the presence of a musical genius. 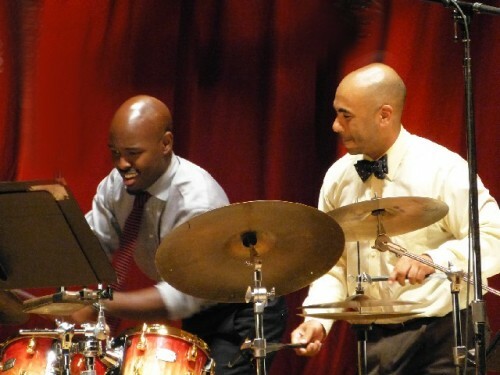 A superb drummer, Ulysses S. Owens, Jr., who appeared in the Tanglewood Jazz Festival last year, completed the rock solid trio anchored by McBride who played the bass with the kind of virtuoso expression, including flowing, lyrical solos, that one associates with a cello or guitar. It is an approach that evokes standards for jazz bass established by Charles Mingus and Ron Carter. The hour plus set by the McBride Trio was so stunning and absorbing that it proved to be a hard act to follow. Rather then just warm the stage for Marsalis the bar was set impossibly high. 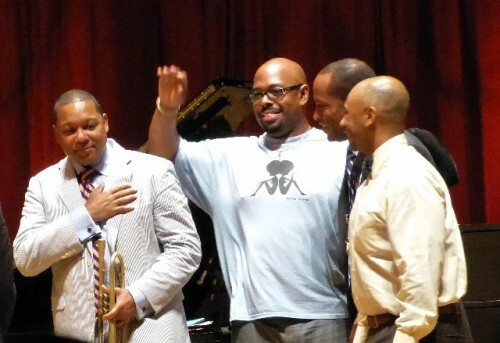 Deliciously, as a finale, Marsalis asked McBride and his trio to join his group. It was an astonishing treat for the audience as McBride and the superb Carlos Henríquez switched off, the drum kit alternated between Owens and Ali Jackson, or Dan Nimmer and Sands took turns at the piano. In the best tradition of a jam session the audience delighted in hearing the musicians straining to push and out perform each other. It was clear that everyone on stage was having a ball. Wow. We hope to see a lot more of that kind of excitement at Tanglewood. They stretched out with a long vamp that featured the improvisational skills of Sands. There were fast runs in the tradition of Peterson, with a delicate, feathery touch. As well as avant-garde excursions that evoked a more lyrical Cecil Taylor or chops comparable to Keith Jarrett, Chick Corea or Herbie Hancock way back when. Yes folks, he’s that good. At times he stood and leaned into the heart of the piano strumming and plucking the strings. 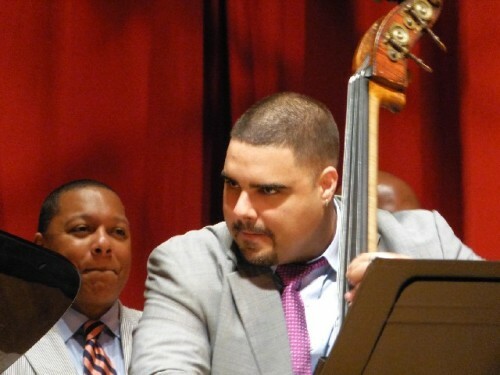 McBride and Owens responded with their own unique flourishes on bass and drums. As the music veered off into the stratosphere I looked about at the attentive but straining response of the audience. Perhaps they were being pushed out of their comfort zone which never really happened with the more mainstream, straight up, laid back, academic playing of Marsalis and his Quintet. Just when it appeared that Sanders was stranded out there at a bridge too far he neatly dropped down into the bridge with a very recognizable, lovely and exotically flavored take on “My Favorite Things” from The Sound of Music. It was a standard that jazz fans associate with the lyrical, sandpaper textured soprano sax of the late John Coltrane. But, while remaining for a time comprehensible, Sanders pushed further than Trane ever strayed on that tune. Having established the melody Sanders then provided ever more extended variations dissecting and reconstructing phrases that were tantalizing echoes of the refrain if you had the chops to follow along. They followed that with a more lyrical retreat to “I Have Dreamed” from The King and I. Perhaps, having pushed the audience to its limit, McBride was recapturing hearts and minds. In a lovely passage McBride bowed his bass. 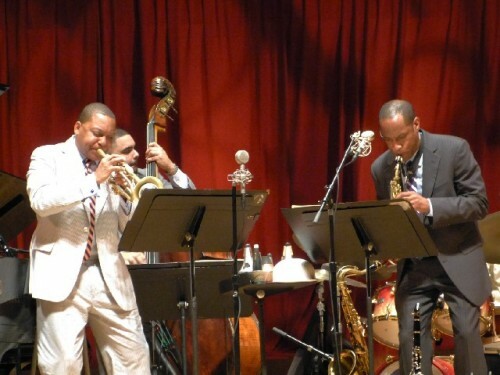 Marsalis opened the set with the complex, multi faceted “Magic Hour.” It presented many different moods and textures. At times he evoked strained, overblown, squeaky textures in a register and manner that recalled the style of Duke Ellington’s upper register specialist Cat Anderson. There were fast, trilling passages echoing the virtuoso vehicle “Flight of the Bumble Bee” by Nikolai Rimsky-Korsakov. It is not surprising to find classical quotes as Marsalis has won Grammys for both his jazz and classical recordings. He recalled how as a “country boy from New Orleans” at just 17 he spent a summer as a Tanglewood Fellow. The experience of being in the company of such serious fellow students and faculty made an enormous impact on his development. 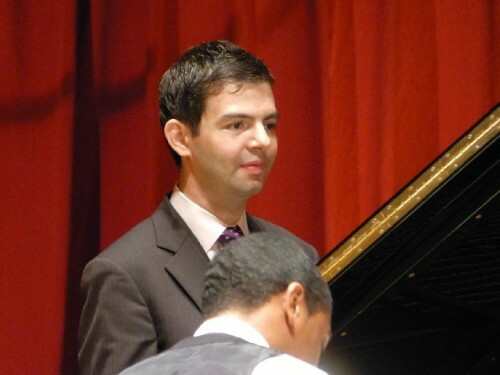 He recalled performing with pianist John Lewis of the Modern Jazz Quartet during the opening celebration for Ozawa Hall. But this was his first Tanglewood performance since 1987. Chatting amiably with the audience he broke down “Magic Hour” about that time of night when parents put their children to bed and all the drama that entails. “It starts with some 4/4 swing, then a bit of comforting blues, followed by some Afro/ Cuban beat while the kids go to sleep and the parent go horizontal.” That was followed by a Benny Goodman standard “Goodbye” composed by Gordon Jenkins. 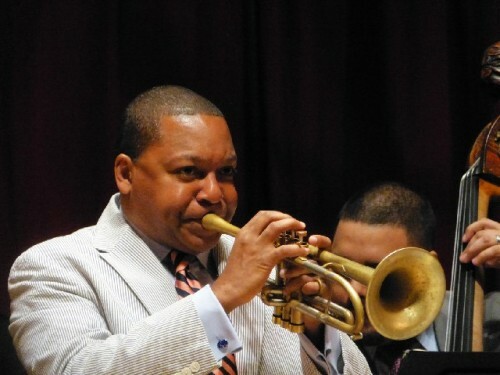 While amiable and charming the playing of Marsalis often seems more technically brilliant than deeply felt. He is acknowledged as the current master of his instrument. But, as such, he lacks the wow factor that we always felt when hearing Miles Davis or Dizzy Gillespie. 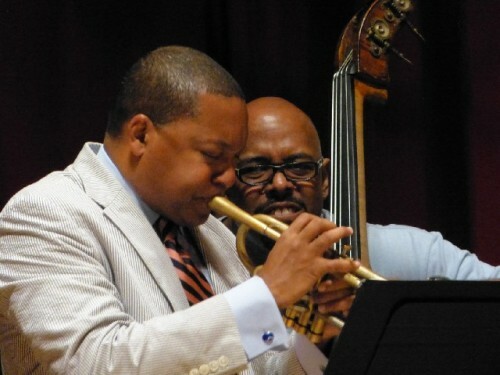 What is most impressive about Marsalis is his deep understanding of all phases and styles of the masters of jazz. He has the ability to channel and demonstrate an amazingly encyclopedic range of classic technique. This was demonstrated brilliantly when he quoted from early New Orleans style jazz with a stunning and spot on recreation of the blues “C.C. Rider” or “See See Rider” which was first recorded by Gertrude Ma Rainey in 1924. He reminded us that it was played by the legendary New Orleans trumpet player Buddy Bolden. That seminal artist never recorded and spent most of his adult life in an asylum. But he is acknowledged as the master who influenced King Oliver, Freddie Keppard, and the teen-aged Louis Armstrong. Introducing the vintage song he said “We need to bring everyone along with us from the bitty bitty children to the old folks.” With Blanding on clarinet they gave a clinic on the style and feeling of early jazz. Blanding’s clarinet licks recalled Johnny Dodds or George Lewis. Marsalis demonstrated both bell mute and plunger mute techniques. From the historic they evolved into a more contemporary take opening up on the blues standard. Yeah, they did bang into each other. That’s what happens when the music is spontaneous, unrehearsed, edgy and competitive. That’s jazz man, and Tanglewood could use a whole lot more swing. "Given the demise of the Tanglewood Jazz Festival and the decrease in jazz programing at WGBH this summer, we've now seen two major Boston institutions with long legacies as custodians of classical music making decisions that adversely affect the availability of jazz to radio listeners and concertgoers in New England."